Updated Sunday February 12, 2017 by AUBL Miami. B.O.S.S. Pools presents AUBL Miami Semi-Pro Baseball broadcast game of the week Sunday 2/12/17 at 5:30 pm at Flamingo Park in South Beach! This special event will be broadcasted on the AUBL Miami Baseball Network. Commentators will be Jay Habacht and Christopher Femino and Edwin Vargas. 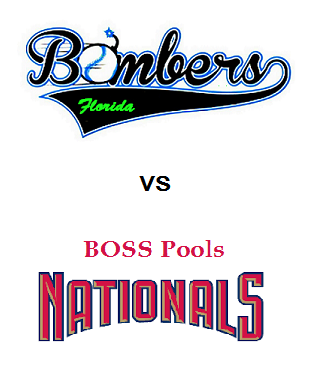 The Florida Bombers are a team built from The Orlando Bombers, an experienced tournament squad. The Bombers have already proven themselves a very worthy opponent! Game 1 vs Spring 2016 Champion Dade Diamondbacks, they lost 5-4 with the tying runner on base in the 9th inning! Game 2, The Bombers beat Las Aguilas and now have a 1-1 record. Bombers Manager Gabriel Gonzalez is an excellent operator and looks to build a powerhouse in AUBL Miami for years to come. The BOSS Pools Nationals are 2 time AUBL Miami Champions and feature former Cy Young winners Gaby Lorenzo and Eric Berkowitz. Former AAA Pawtucket Red Sox player Jorge Marban has also joined a fearsome rotation. The money man Tony Cash, Ivan Asencion and Juan Nunez lead an offense that has been potent in season's past. The Nats have some new faces as well. The Nats are coming off of a huge win vs The South Dade Toyota Braves and a 2-2 tie vs a very tough Miami Storm squad.